Posada McBean is located in Providencia, 550 metres from El Embrujo Airport and 1 km from Maracaibo Bay. It features an extensive garden and Split Hill Mountain views. Guests will get to the island via airplane or Catamaran departing from San Andres Island. Each room here will provide you with a TV and cable channels. You can enjoy garden view from the room. Extras include bed linen and a fan. Other amenities offered are laundry service for an extra charge and free daily maid service. Activities such as snorkelling are available. This property is 8 km from Manzanillo Bay and 10 km from Aguadulce Bay. 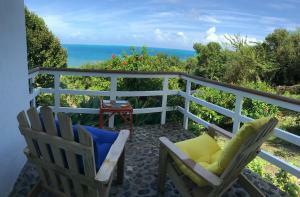 When would you like to stay at Posada McBean ? This double room has a view, tile/marble floor and air conditioning. Please inform Posada McBean in advance of your expected arrival time. You can use the Special Requests box when booking, or contact the property directly with the contact details provided in your confirmation. Payment before arrival via bank transfer is required. The property will contact you after you book to provide instructions. Please note the only way to reach the island is through a 20' minutes Satena flight or by Catamaran in two hours and a half, guests are advised to reserve their transportation in advance. Each day we'll check prices and send you an email for your selected dates at Posada McBean. If you don't have specific dates but would like to check prices for say next weekend or say next month we can check the price too. Click to write a review and share your experience of Posada McBean with other travellers.